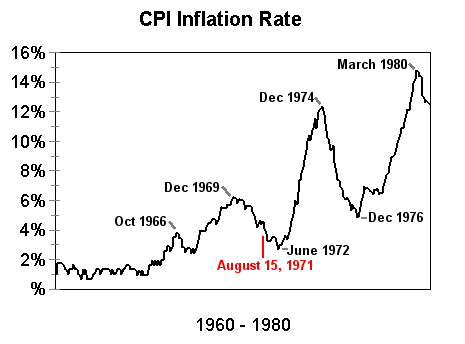 In August 15th, 1971 Nixon froze prices and wages change. What was Nixon's wage and price control's impact on the economy, why was it necessary and what happened when it was released, that caused a recession ? To prevent a run on the dollar, stabilize the US economy, and decrease US unemployment and inflation rates, on August 15, 1971, Nixon issued Executive Order 11615, pursuant to the Economic Stabilization Act of 1970, which imposed a 90-day maximum wage and price ceiling, a 10% import surcharge and most importantly, "closed the gold window", ending convertibility between U.S. dollars and gold. Thus the freeze by itself is almost irrelevant compared to the economic consequences of abandoning the gold standard. The combination is called the "Nixon Shock", and its effects on the world economy are still being debated - see the last section of that Wikipedia article for examples and quotes. Not the answer you're looking for? Browse other questions tagged history economy or ask your own question.